The meson octet. Particles along the same horizontal line share the same strangeness, s, while those on the same left-leaning diagonals share the same charge, q. In physics, the eightfold way is an organizional scheme for a class of subatomic particles known as hadrons that led to the development of the quark model. 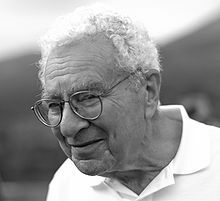 American physicist Murray Gell-Mann and Israeli physicist Yuval Ne'eman both proposed the idea in 1961. [notes 1] The name comes from Gell-Mann's 1961 paper and is an allusion to the Noble Eightfold Path of Buddhism. By 1947, physicists believed that they had a good understanding of the what the smallest bits of matter were. There were electrons, protons, neutrons, and photons (the components that make up the vast part of everyday experience such as atoms and light) along with a handful of unstable (i.e., they undergo radioactive decay) exotic particles needed to explain cosmic rays observations such as pions, muons and hypothesized neutrino. In addition, the discovery of the positron suggested there could be anti-particles for each of them. It was known a "strong interaction" must exist to overcome electrostatic repulsion in nuclei. Not all particles are influenced by this strong force but those that are are dubbed "hadrons", which are now further classified as mesons (middle mass) and baryons (heavy weight). But the discovery of the (neutral) kaon in late 1947 and the subsequent discovery of a positively charged kaon in 1949 extended the meson family in an unexpected way and in 1950 the lambda particle did the same thing for the baryon family. These particles decay much slower than they are produced, a hint that there are two different physical processes involved as suggested by Abraham Pais in 1952. Then in 1953, M. Gell Mann and a Japanese pair, Tadao Nakano and Kazuhiko Nishijima, independently suggested a new conserved value now-known as "strangeness" during their attempts to understand the growing collection of known particles. [notes 2] The trend of discovering new mesons and baryons would continue through the 1950s as the number of known "elementary" particles ballooned. Physicists were interested in understanding hadron-hadron interactions via the strong interaction. The concept of isospin, introduced in 1932 by Heisenburg shortly after the discovery of the neutron, was used to group some hadrons together into "multiplets" but no successful scientific theory as yet covered the hadrons as a whole. This was the beginning of a chaotic period in particle physics that has become known as the "particle zoo" era. The eightfold way ended up being an important big step towards the quark model solution. Group representation theory is the mathematical underpinning behind the eightfold way but this rather technical mathematics is not needed to understand how it helps organize particles. Particles are sorted into grouped as mesons or baryons. Within each group, they are further separated by their spin angular momentum. Symmetrical patterns appear when these groups of particles have their strangeness plotted against their electric charge. (This is the most common way to make these plots today but originally physicists used an equivalent pair of properties called hypercharge and isotopic spin, the latter of which is now known as isospin.) The symmetry in these patterns is a hint of the underlying symmetry of the strong interaction between the particles themselves. In the plots below, points representing particles that lie along the same horizontal line share the same strangeness, s, while those on the same left-leaning diagonals share the same electric charge, q. In the original eightfold way, the mesons were organized into octets and singlets. This is one of the finer points of differences between the eightfold way and the quark model it inspired that suggests the mesons should be grouped into nonets (groups of nine). Diametrically opposite particles in the diagram are anti-particles of one-another while particles in the center of their own anti-particle. Under the quark model later developed, it is better viewed as part of a meson nonet, as previously mentioned. The principles of the eightfold way also applied to the spin-3/2 baryons, forming a decuplet. and predicted in 1962 that it would have a strangeness −3, electric charge −1 and a mass near 7003168000000000000♠1680 MeV/c2. In 1964, a particle closely matching these predictions was discovered by a particle accelerator group at Brookhaven. Gell-Mann received the 1969 Nobel Prize in Physics for his work on the theory of elementary particles. Historically, quarks were motivated by an understanding of flavour symmetry. First, it was noticed (1961) that groups of particles were related to each other in a way that matched the representation theory of SU(3). From that, it was inferred that there is an approximate symmetry of the universe which is parametrized by the group SU(3). Finally (1964), this led to the discovery of three light quarks (up, down, and strange) interchanged by these SU(3) transformations. The eightfold way may be understood in modern terms as a consequence of flavor symmetries between various kinds of quarks. Since the strong nuclear force affects quarks the same way regardless of their flavor, replacing one flavor of quark with another in a hadron should not alter its mass very much, provided the respective quark masses are smaller than the strong interaction scale—which holds for the three lights quarks. Mathematically, this replacement may be described by elements of the SU(3) group. The octets and other hadron arrangements are representations of this group. is a transformation that simultaneously turns all the up quarks in the universe into down quarks and vice versa. More specifically, these flavour rotations are exact symmetries if only strong force interactions are looked at, but they are not truly exact symmetries of the universe because the three quarks have different masses and different electroweak interactions. This approximate symmetry is called flavour symmetry, or more specifically flavour SU(3) symmetry.
. Depending on A, this new state might be a proton, or a neutron, or a superposition of a proton and a neutron, or various other possibilities. The set of all possible quantum states spans a vector space. Representation theory is a mathematical theory that describes the situation where elements of a group (here, the flavour rotations A in the group SU(3)) are automorphisms of a vector space (here, the set of all possible quantum states that you get from flavour-rotating a proton). Therefore, by studying the representation theory of SU(3), we can learn the possibilities for what the vector space is and how it is affected by flavour symmetry. ). This corresponds to an 8-dimensional ("octet") representation of the group SU(3). Since A is an approximate symmetry, all the particles in this octet have similar mass. (3) instead of the Lie group SU(3), since the former is simpler and the two are ultimately equivalent. After the circulation of the preliminary version of this work (January, 1961) the author has learned of a similar theory put forward independently and simultaneously by Y. Ne'eman (Nuclear Physics, to be published). Earlier uses of the 3-dimensional unitary group in connection with the Sakata model are reported by Y. Ohnuki at the 1960 Rochester Conference on High Energy Physics. A. Salam and J. Ward (Nuovo Cimento, to be published) have considered related questions. The author would like to thank Dr. Ne'eman and Professor Salam for communicating their results to him. I am indebted to Prof. A. Salam for discussions on this problem. In fact, when I presented this paper to him, he showed me a study he had done on the unitary theory of the Sakata model, treated as a gauge, and thus producing a similar set of vector bosons. Shortly after the present paper was written, a further version, utilizing the 8-representation for baryons, as in this paper, reached us in a preprint by Prof. M. Gell Mann. After the completion of this work, the authors knew in a private letter from Prof. Nambu to Prof. Hayakawa that Dr. Gell-Mann has also developed a similar theory. ^ Gell-Mann, M. (March 15, 1961). "The Eightfold Way: A Theory of Strong Interaction Symmetry" (TID-12608). Pasadena, CA: California Inst. of Tech., Synchrotron Laboratory. doi:10.2172/4008239. ^ Ne'eman, Y. (August 1961). "Derivation of Strong Interactions from a Gauge Invariance". Nuclear Physics. Amsterdam: North-Holland Publishing Co. 26 (2): 222–229. doi:10.1016/0029-5582(61)90134-1. ^ Young, Hugh D.; Freedman, Roger A. (2004). Sears and Zemansky's University Physics with Modern Physics. contributions by A. Lewis Ford (11th International ed.). San Francisco, CA: Pearson/Addison Wesley. p. 1689. ISBN 0-8053-8684-X. The name is a slightly irreverent reference to the Noble Eightfold Path, a set of principles for right living in Buddhism. ^ Gell-Mann, M. (November 1953). "Isotopic Spin and New Unstable Particles". Phys. Rev. 92 (3): 833–834. doi:10.1103/PhysRev.92.833. ^ Nakano, Tadao; Nishijima, Kazuhiko (November 1953). "Charge Independence for V-particles". Progress of Theoretical Physics. 10 (5): 581–582. doi:10.1143/PTP.10.581. ^ Gell-Mann, M. (1961). "The Eightfold Way: A Theory of strong interaction symmetry" (No. TID-12608; CTSL-20). California Inst. of Tech., Pasadena. Synchrotron Lab (online). Gell-Mann, M. (1962). "Symmetries of baryons and mesons", Physical Review 125 (3), 1067. ^ Barnes, V. E.; et al. (1964). "Observation of a Hyperon with Strangeness Minus Three" (PDF). Physical Review Letters. 12 (8): 204. Bibcode:1964PhRvL..12..204B. doi:10.1103/PhysRevLett.12.204. ^ D. Griffiths (2008). Introduction to Elementary Particles 2nd.Ed. Wiley-VCH. ISBN 3527406018.